The classic Revlon nail polishes usually last more than a week on my nails with no chipping in sight, so I was more interested to see the different finish that Revlon Colorstay Gel Envy supposedly offer. I can't speak for other shades, but Roulette Rush certainly has a gel like consistency that is not too thick nor too thin. I must say I like the formula a lot. No funky smell this time, although it still smells like a nail polish. Revlon Colorstay Gel Envy comes with a wider and stiffer brush. I myself prefer a normal size brush for my somewhat narrow and curved nail beds, so this is not a plus point for me. Technically speaking, Roulette Rush is not a creme polish since it contains very fine blue-colored micro shimmer. However, it reads a red creme because the shimmer is so tiny that it flashes faintly blue only under certain lightings. 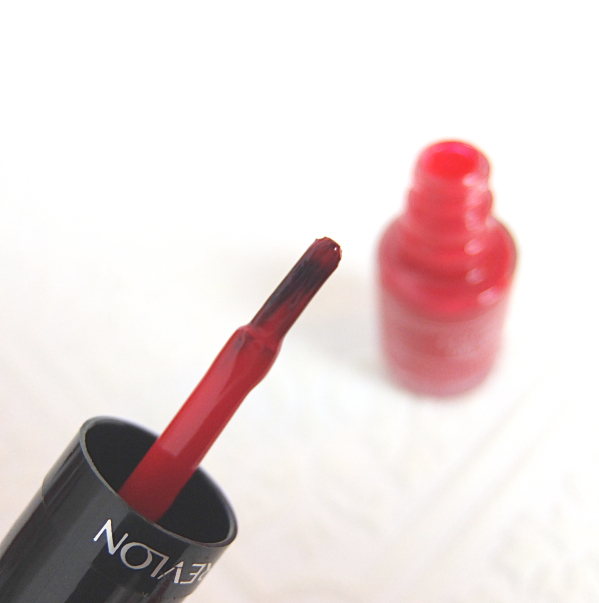 Roulette Rush is a beautiful red that complements my skin tone very well, but the best part is its excellent formula. It applies like a dream that I only need one coat. That's right. I'm wearing just a single coat! I skipped a base coat since the new Gel Envy boasts a built-in base coat, but added my usual topcoat Seche Vite. It has been already 4 days and I find it looks fresh even without showing a sign of tip wear. I do wish the color selection was more interesting, but I would highly recommend this line for a great formula that wears well. If you're in the North America, you can pretty much find it everywhere. It is quite affordable, too. The formula sounds pretty amazing - one coat!? I'm not sure any of the shades jump out at me, but I might have to check them out. Four days and it still pretty much looks like when you first applied? Wow, that's pretty good! I LOVE the gel finish. Basically I love a glossy finish on all of my polishes! One of my first nail polishes was a pinky coral one with micro shimmer, it was sheer and needed 3 coats to be opaque but I loved it! Gel-creme finish is my favorite, ever! I think Revlon here is light years behind... we don't get such awesome nail polishes, and I think what we have are your grandma's formula. HAHAHAHA! I'm pretty sure the gel effect would be enhanced even more if I apply two coats. I don't usually wear red nail polish, but this one is so pretty and elegant. And the gel formula is very tempting, since I have so much trouble getting polish to stay on my nails for more than two days. Also, I love the shape of your nails! That sounds so creepy now that I see it typed out...oh, well. Wow that is amazing for one coat! Looks so fresh against your skintone too, great pick! I have a couple of these lying around but haven't tried them. Sounds like a great formula! But is it hard to take off? That's what scare me LOL. Love the red on you! Gorgeous red! And only one coat? That's amazing O.o Looks great! I broke up with drugstore polishes because they ALL seemed to chip on me, no matter what, but hey, that's really pretty! I like the fat, wide brushes if they taper down to a point, but the OPI ones also drive me nuts, because who has wide, SQUARE cuticles? NO ONE. If you see tutorials like "how to use OPI prowide brush" on the web, that is already a sign it is a disaster. LOL. To think about it, I only like Revlon polishes from drugstore. L'Oreal got better ever since they acquired Essie, but I usually just stick with affordable salon brands like Essie. Yep - every Sally Hansen polish I've tried chips in a day or two, no matter what basecoat I use! It's a shame, because they make a lot of pretty colors and always seem to be on trend. I can imagine wider brushes would work better for nail beds that are now curved to the sides like mine. Maybe more people have that type of nails since now we see more brands use wider brushes. Oh what a coincidence, I just received the ColorStay Gel Envy Collection yesterday! It only has six colors here though, en Roulette Rush is not in it. Shame, because it looks really pretty. I'm wearing a blue and a purple from the collection now and so far so good. I loooove the super shiny finish and the texture really does feel gel-like. I initially thought the colours were quite basic but they're sort of spot-on. Like, you need a classic red? Here you go! Need a bright blue? Here! I've started to give out the samples I acquired but am keeping a few because they're generally easy to apply and look nice. I like this red a lot more compared to Chanel's 900 other reds, for example. That makes a lot of sense! And I agree with you. 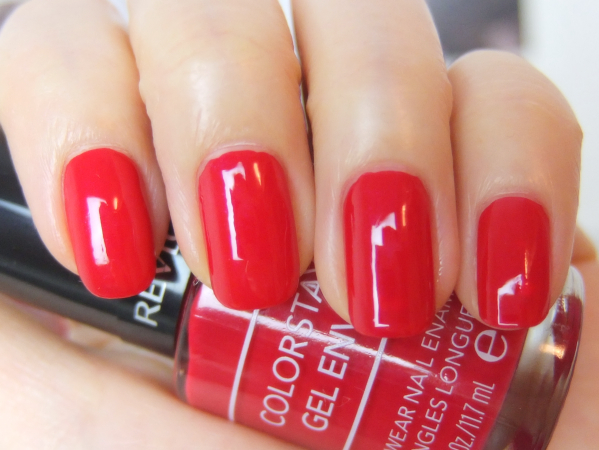 I never thought Chanel red polishes are better than Revlon (or even Essie) ones.